mGive Foundation Study Challenges NPOs – the ajayi effect. 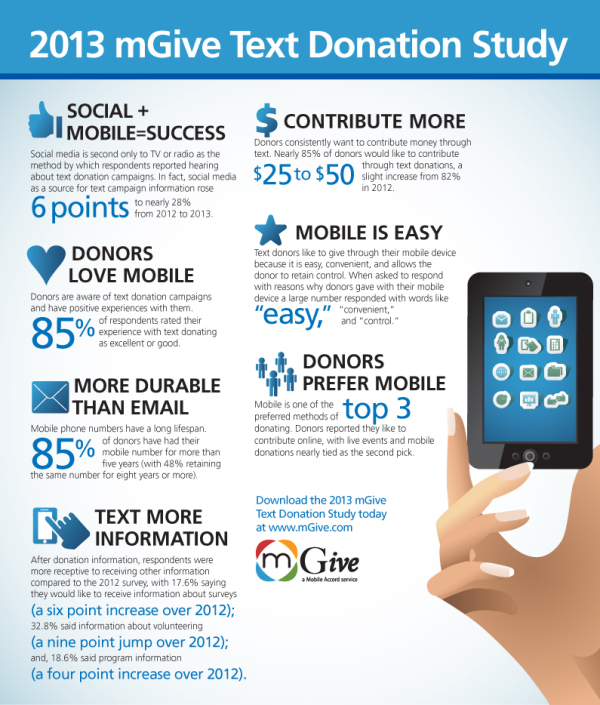 mGive Foundation, a 501(c)(3) established to make it easy for nonprofits to quickly execute effective text donation campaigns – and for mobile operators to support them, recently released a study which (I hope) will finally put to bed that text-to-give is the only way to mobile fund-raise. The focus of the study was to examine, who mobile donors are by obtaining basic demographics; whether donation via text impacts the likelihood of donation through other channels or the amount given through other channels; preferred subscriber communication content; what dollar amount donors are comfortable with donating via text and more. 1. Mobile phone numbers have a long lifespan. Seventy-five percent of donors have had their mobile number for more than five years (with 48 percent retaining the same number for eight years or more). 2. Mobile is only one of the top three preferred methods of donating. Donors reported they like to contribute online, with live events and mobile donations nearly tied as the second pick. percent said information about volunteering (a nine point jump over 2012); and, 18.6 percent said program information (a four point increase over 2012). Point #5 is my fave. Now will organizations begin to think outside of the box? We shall see. In the meantime, read the report yourself.